Bring relevant material with them, including a copy of the assignment or professor's instructions, a CLEAN copy of the document to be reviewed (only 1 per session), and specific questions/concerns. Arrive on time. Students should not be more than ten minutes late for an appointment. Students who are more than ten minutes late may lose their appointment to another student. Students may not "leave a copy" of an essay to be "picked up" at a later time/date. Must make an appointment by registering and signing up in the online scheduler (our database) at: http://www.rich75.com/cob. The appointment session will take place in the LRC in Room F8. Each session generally runs for 50 mins. Must bring relevant material with them, i.e. the assignment and/or instructions, a CLEAN copy of the document to be reviewed (only 1 per session), specific questions/concerns. Should not be more than ten minutes late for an appointment. Students who are more than ten minutes late will lose the time slot to another student and will have to make another appointment online. Students who need help with essays may be limited to two sessions per week, but may come in as often as necessary to complete/review grammar exercises, read, write, study, etc. E-mail an electronic copy of their short papers (4-6 pages) at least 1 day in advance of their appointment. Submit longer research/term papers at least 2 days in advance of their appointment. Review information/web sites relating to their writing projects. If it becomes necessary during the course of the semester, students will be given a two hour time limit for computer use. 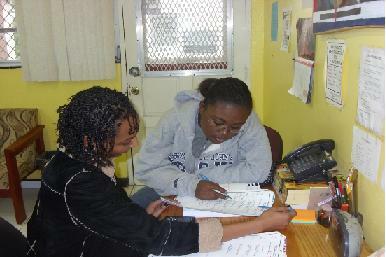 Making an appointment with the LRC is very easy and convenient. All you need is a computer with Internet access. Be sure to enter an email address that you use frequently! After you have registered, return to the first page and log in with your new user name and password to view the current schedule. Once you have done so, you will be able to see the available spots for appointments as white spaces. 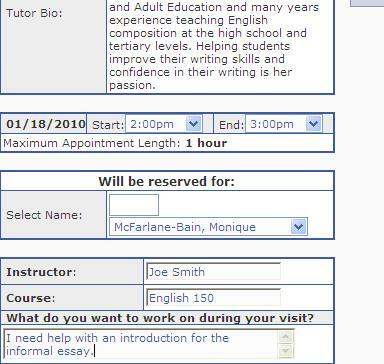 Simply click on the desired white space next to a tutor's name to make an appointment. A new window will open which will allow you to select the 'Start' and 'End' times for each appointment ( for 1 hour only). Please indicate the name of your course instructor, the name of the course and what, specifically, you would like help with in this window as well. 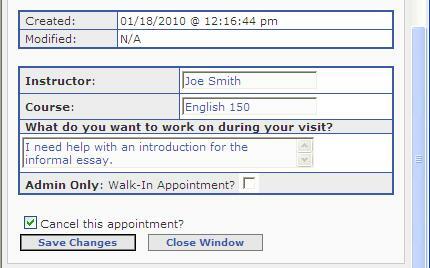 Once you have successfully entered an appointment, it will show up as a yellow/mustard space on your schedule. You will also receive a confirmation notice in your email account. Cancelling an appointment (due to scheduling conflicts, something comes up, etc.) is easy as well. 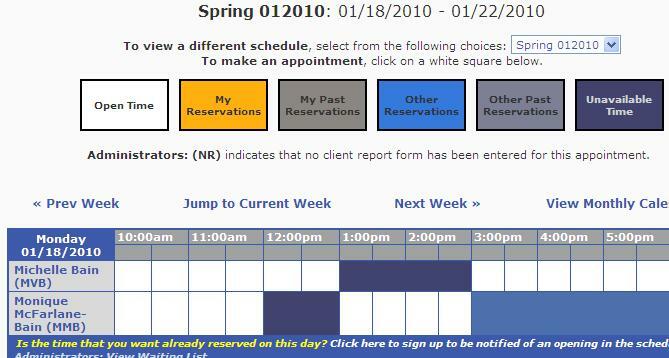 Simply click on the yellow/mustard space which represents your appointment. Scroll to the bottom of the new window, check the 'Cancel this appointment?' box, then select 'Save Changes'. Please note that if you miss 2 reserved appointments without notice, the online system will restrict your ability to make new ones. Please call to cancel only if you experience any difficulties with the system or do not have computer/Internet access to do so.